WASHINGTON – The Mexican ambassador to the U.S. said Tuesday that his country’s relationship with the Trump administration is in better shape than it was a year and a half ago, but that there is still room for improvement. Gutierrez noted three major areas where the two countries differ: trade, security and immigration. “It’s no secret that we have three big, important cracks in the relationship,” he said. His remarks come just two days after Mexican voters overwhelmingly elected Andres Manuel Lopez Obrador as their next president, a leftist and reformer who has been called Mexico’s version of President Donald Trump. Gutierrez said he is hopeful about the relationship between the two countries, citing what he called a lack of “anti-American sentiment” in Mexican presidential campaigns. And Trump and Obrador appear to be off to a friendly start, with the president sending a prompt congratulatory tweet to the president-elect, and the two leaders speaking over the phone Monday. But while the two men appear to be getting along, the Mexican people currently have an unfavorable view of America – roughly two thirds of Mexicans surveyed in a recent Pew Research poll said they viewed the U.S. negatively in 2017. 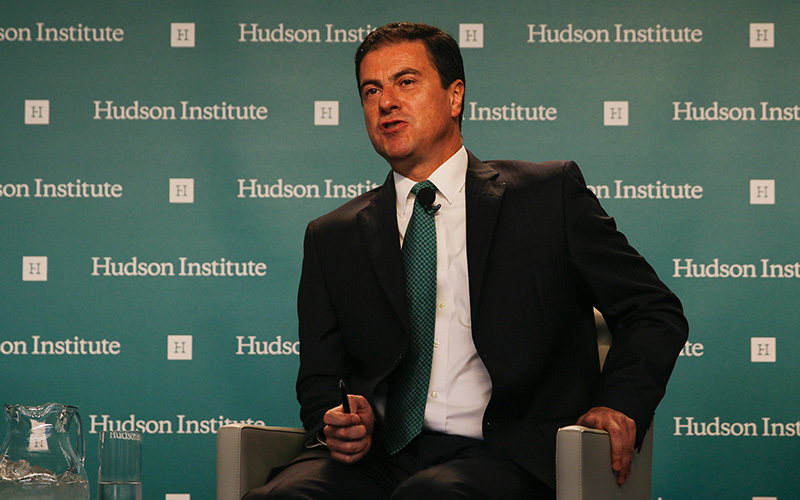 Despite that, Duncan Wood, director of the Wilson Center’s Mexico Institute, said Mexicans generally recognize the importance of a positive relationship between the two countries. He said that while there are increased tensions in the bilateral relationship, cooperation on key initiatives has improved immensely. “It’s accurate to say we have never seen this much cooperation between Mexico and the United States on security issues,” he said in a telephone interview Tuesday from Mexico. Gutierrez said that the two countries, as well as Central American countries, need to have a “serious conversation” about immigration. He said that while not enough has been done, he has seen “an openness, at least” from the Trump administration on immigration. Another pressing issue is the renegotiation of the North American Free Trade Agreement. While Trump has repeatedly complained about the agreement, Gutierrez said Mexico and Canada are ready and waiting to finish renegotiating the deal. Gutierrez said he thinks Trump’s focus on the U.S. trade deficit is misplaced, but that it will not get in the way of continued negotiations. Cracks like NAFTA and immigration in otherwise improving relations between Mexico and the U.S. represent what Wood called a “paradoxical” relationship. While the countries are working together on a variety of issues, the overall relationship has become strained of late, thanks to Trump pressuring Mexico on migration issues in recent months. But Wood warned that any friendliness between Trump – who called Mexicans rapists during his campaign – and the soon-to-be Mexican president could quickly turn south if Trump returns to his previous ways.